For several years, the small-sized and even smaller priced Baofeng UV-5R has been the most popular budget HT ‘walkie-talkie’ radio transceiver. Although primarily intended for licensed radio ham operators, many of them have been purchased by people to use as ‘super’ FRS and GMRS radios, a (mis)use that is notionally illegal but almost never enforced by the FCC. We’ve written several articles about this lovely radio, see, for example, ‘The Best Radio for FRS/GMRS‘ and also read through our articles on Communications in general for a lot of resource. Baofeng have released a somewhat confusing variety of other models of radio (in particular, the UV-82 series), none of which have been compelling ‘upgrades’ to the core UV-5R radio. Confusing the matter further, their various distributors have often rebadged and repackaged the UV-5R and given it new names, or implied it to be a new, improved, updated, enhanced subsequent model. As far as we can tell, none of their claims have any foundation in truth at all, and no matter what the outside case of the radio, and no matter what its alleged model number, all such versions of the UV-5R are almost exactly the same, other than for occasionally updated versions of the firmware inside them, and all perform essentially identically. Resellers also make varying claims about being official and sometimes the only official dealers for ‘real’ Baofeng radios, and these claims are also to be taken with a degree of open-minded skepticism – as best we can tell, Baofeng will happily sell their products to anyone who will buy them, and will slightly alter them as major customers may request. To make it more confusing, the Baofeng radios are also sometimes called Pofung radios (this spelling more closely indicates how the underlying Chinese word is pronounced). Again, there is no difference. But now a truly new model has been released, and it truly is better than the standard UV-5R. This is the model BF-F8HP. Already, we are seeing a confusing diversity of model numbers surrounding this new radio type, as well. The F8HP designation seems to be the official default designation, but there are other variants such as F9-V2+ (which seems to attempt to imply it is a later model than the F8) and the F8+ (which is actually a UV-5R). There are three key differences between this new radio and the earlier UV-5R series, and one very important similarity. 1. The new F8HP has three power settings rather than two. The UV-5R had two power settings, and on high power was nominally claimed to be outputting 4 watts of power, and typically was closer to 4 watts on the 2 m band and 3 watts on the 70 cm band. The F8HP has a low power that is similar to the UV-5R low power setting, a mid power which is similar to the UV-5R high power setting, and a high power which nominally gives you 8 watts and has been tested to give about 7 1/2 watts on 2m and 6 watts on 70cm. That’s an appreciable boost in power, and may give you a slight increase in range in some settings. 2. A new battery with more capacity. The UV-5R typically had a battery claiming about an 1800 mAh capacity (and more realistically giving you 1500 mAh). The new F8HP has a battery with a rated 2100 mAh capacity and good for about 2000 mAh. The battery is the same size, but uses newer cells that have higher capacity. You can never have too much battery, especially if you’re now using it at a much greater rate on the high power transmit setting. 3. The new F8HP has a greatly improved antenna provided as standard. The new style antenna is on the left, the old style is on the right. This truly does make an appreciable difference to the radio’s ability to both send and receive signals a longer distance. 4. The similarity : All accessories that work with the UV-5R series also work with the F8HP. That includes batteries as well as external microphones and speakers, and of course, antennas too. So whatever you’ve bought already can be repurposed for the F8HP. There are a few other minor differences too. The new radio has some slightly improved internal circuitry, and a much better written 76 page manual. Oh yes, it is also more expensive (but still great value), and currently can be found on Amazon for around $63 , which is almost exactly twice the price of the UV-5R (which remains available for sale, too). The F8HP operates on the same frequencies and has the same wide range of features and options, and can also be programmed through the same programming cables and the excellent free CHIRP software. So – should you buy F8HP radios or twice as many UV-5R radios for the same amount of money? We’re always keen to get the latest and greatest and best of everything, but the truth is that many times, the UV-5R will be all the radio you need. If you get clear and reliable communications when using UV-5R radios, and especially if you are using them in low power mode, then there’s not really any need to get the F8HP. If your UV-5R radios are struggling to connect to each other, then a better investment might be improved antennas on the UV-5Rs, rather than junking them and buying F8HPs. A UV-5R with a good antenna (a Nagoya 701 or 771 , for example) will generally give you comparable performance to a F8HP with its standard antenna. But if you still have range issues, then, yes, you should get the F8HP. 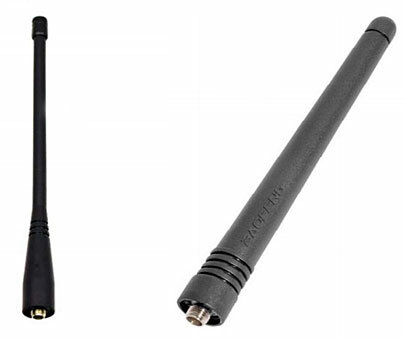 A F8HP, on high power, and with an improved antenna, will beat the UV-5R every time. As for us, we’re not junking any of our collection of UV-5R radios, but future purchases will all be of the F8HP. Who knows what evolving needs and scenarios might come to pass, and you can never have too much range or battery life in your radio (although note that the UV-5R can also accept the same battery, and both can also use the extended battery or battery eliminators too).